Free spans up to 200 feet without intermediate supports. Lower end loads, which means easier installations in more and different locations. Multiple end-anchor choices for every situation: rebar clamps, concrete beam straps, anchors, concrete inserts, weld-on lugs, bolt-on clamps, I-Beam clamps and more. Available with a choice of stanchions to raise the lifeline above the walkway or with in-line clamps where overhead structure exists. 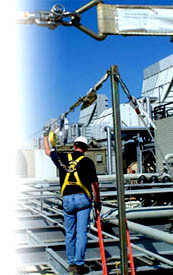 All systems are available with bypass supports to reduce line tension and limit fall distances. Reliance systems are engineered, so you're assured they'll comply with all applicable OSHA and ANSI requirements and standards. They're supplied with complete documentation so they will meet the requirements for anchorage performance, design and component traceability for OSHA inspections. And at a reasonable price.